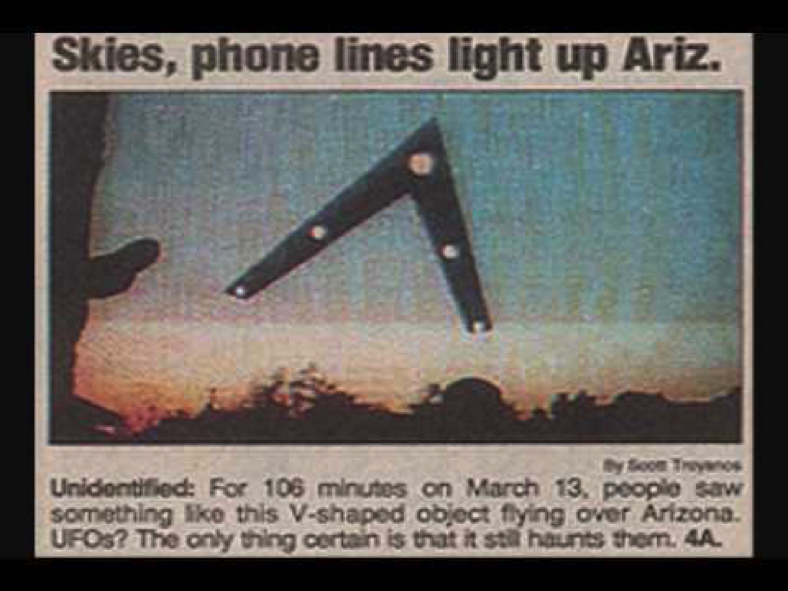 The Phoenix Lights or Lights Over Phoenix was a UFO sighting event witnessed by thousands of people in the Phoenix, Arizona, and Sonora, Mexico area on Thursday, March 13, 1997. 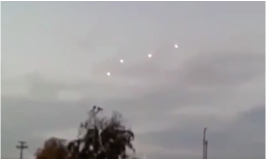 Witnesses described seeing a large triangle craft or triangular formation of lights in a V-shape formation. It was estimated to be several football fields in size. The object would block out the stars as it passed silently over head. 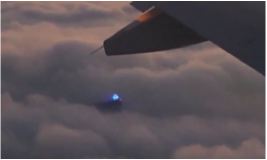 The object appeared to contain five spherical lights or possibly light-emitting engines. 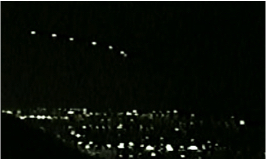 The governor of Arizona at the time, Fife Symington, was also a witness of the Phoenix Lights. At the time of the sighting, he ridiculed the story by holding a press meeting attended by a person in an alien suit. 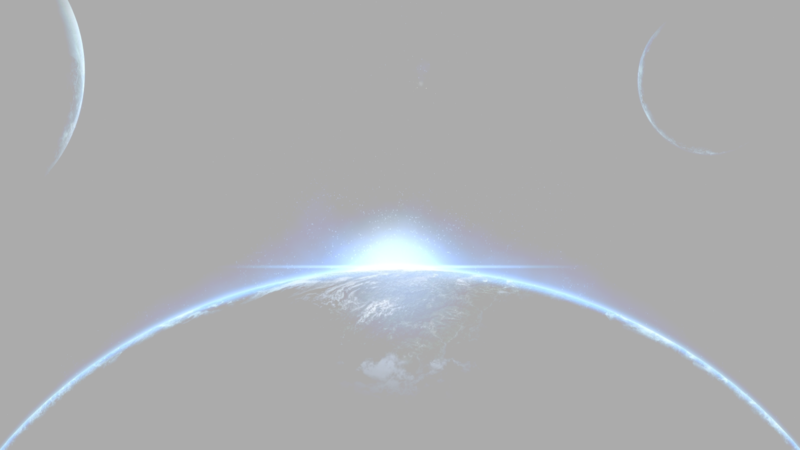 Years later, he admitted witnessing the lights and considered them "other worldly". 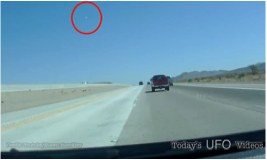 The first witness to report the lights was a man from Henderson, Nevada described the object as a large V-shaped object about the size of a 747 that made the sound of "rushing wind" when it passed over and it had six lights on its leading edge. The second witness to report the incident was a retired police officer from Paulden, Arizona. While driving north he saw a cluster of reddish or orange lights in the sky with four lights together and a fifth light trailing them.
" While doing astrophotography I observed five yellow-white lights in a "V" formation moving slowly from the northwest, across the sky to the northeast, then turn almost due south and continue until out of sight. The point of the "V" was in the direction of movement. The first three lights were in a fairly tight "V" while two of the lights were further back along the lines of the "V"'s legs. During the NW-NE transit one of the trailing lights moved up and joined the three and then dropped back to the trailing position. I estimated the three light "V" to cover about 0.5 degrees of sky and the whole group of five lights to cover about 1 degree of sky." One account was from Tim Ley, his wife, son and grandson who all witnessed the lights. 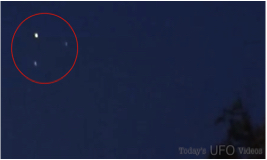 At first it appeared to be five distint lights in an arch shape, but as they came closer over the next 10 to 20 minutes, the lights took on the shape of an upside down V.
When the lights became closer, only a couple of miles away, the crafts features became clear. It was the shape of a 60 degrees carpenter's square with five lights that were set into it. One light at the front and two on each side. Eventually the object flew slowly and silently over their heads at about 150 feet off the ground. The object then flew through a V-shaped clearing in the woods heading towards the direction of the Phoenix Sky Harbor International Airport. "I'll never be the same. Before this, if anybody had told me they saw a UFO, I would've said, 'Yeah and I believe in the Tooth Fairy.' Now I've got a whole new view and I may be just a dumb truck driver, but I've seen something that don't belong here." "a large and bizarre cluster of stars moving slowly in the northern sky"
As thousands of reports came flooding in, it was apparent this was not a normal occurrence. The event has also been broken down into two sightings. One event containing an arch of lights appearing one at a time and being an estimated mile in size that hovered over the Phoenix Area. 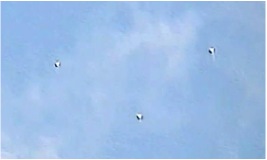 The second sighting reports a large V-shaped boomerang craft, silently gliding over head at a low altitude. The sighting was noted in local newspapers, but didn't gain popularity until June 18, 1997, when USA Today ran a front-page story that brought national attention to the case. Quickly following suit was NBC and CBS television networks. The Arizona Governor at the time,Fife Symington III held a press conference, stating that "they found who was responsible". Making light of the situation, he brought his aide on stage dressed with him dressed in an alien costume. Symington finally confessed to witnessing the lights in a March 2007 interview with the The Daily Courier in Prescott, Arizona stating that he had seen one of the "crafts of unknown origin" during the 1997 event, but did not go public with the information. "As a pilot and a former Air Force Officer, I can definitively say that this craft did not resemble any man made object I'd ever seen. 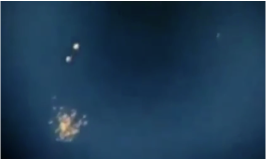 And it was certainly not high-altitude flares because flares don't fly in formation..."
Symington said that he had contacted the military about the lights when he was governor, but their response was "no comment". 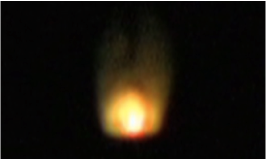 A collection of the latest UFO sighting footage from Phoenix,Arizona which has recently become a UFO hotspot once again. 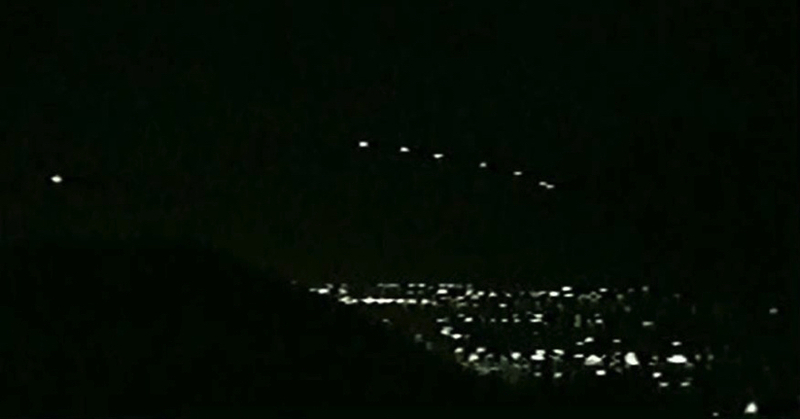 In early 2015, the Phoenix Lights Returned.